UK/Ireland, 2011, 113 minutes, Colour. 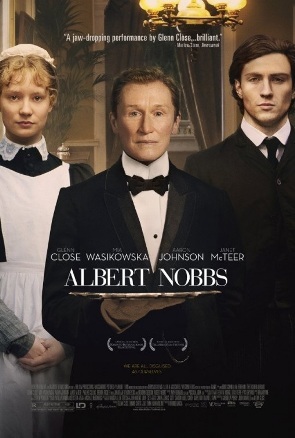 Glenn Close, Janet Mc Teer, Mia Wasikowska, Jonathan Rhys Meyers, Aaron Johnson, Brendan Gleeson, Brenda Fricker, Mark Williams, Maria Doyle Kennedy, Pauline Collins, Bronagh Gallagher. 1. A 19th century novella? A period drama? Comic touches? Recreating the atmosphere of the period? From the perspective of the 21st century? 2. The Irish setting, Dublin, the Victorian era, the hotel and its interiors, the streets, the areas, the slums, the coast? The atmosphere of Dublin? The musical score and its atmosphere? The concluding song? 3. The focus on cross-dressing, gender, identity? Society and expectations? Masculine and feminine? Relationships? Sexuality? 4. The film as Glenn Close’s project, her performances on stage, co-writing, producing, starring? A self-effacing tour de force? Her appearance, age, androgynous, gaunt, short, her hair? Her clothes, the servant? The formal clothes and hat of the 19th century? The British accent? Albert’s story, England, going to Ireland, working in hotels? Meticulous service? Very proper, knowing the guests, the treatment of the guests, courtesy, waiting and serving, going to his room, privacy? The detail of the chores of the hotel? The relationship with Mrs Baker and her dominance? His life, the tips, counting them, keeping the results in the book, the money under the floorboards? Albert’s hopes? The visualising of the dreams of the shop, Hugo and Cathleen? With Helen? 5. Albert, the fancy dress party, the interactions with the doctor, disguised as themselves? The relationship with Helen, protective, defending her, dying for her? The irony of Mrs Baker getting the money? The irony of her paying Hugo to paint the hotel? Hugo finding Helen and using the money to care for Helen? Albert’s achievement? 6. Mrs Baker, her fawning attitude, society, the guests, nobility? Yet the permissive touch with Viscount Yarrell? Drawing on her Christian beliefs and charity? Her treatment of people, the boiler, liking Joe, her attitude towards the maids, to the people in the kitchen? Hugo and his painting, her wanting him back? The effect of the typhoid, the death, the guests leaving, thinking that she was ruined? The fight back? Her encounter with Joe, the fight, Albert, the death? Finding the book, the money, using it for the painting? Intending to oust Helen? The irony of Albert’s money helping Helen? 7. Hugo, as the painter, assigned to share the room with Albert, Albert’s hesitations, uncomfortable? In the bed, the flea, Hugo glimpsing Albert and discovering that Albert was a woman? Going to sleep? Albert’s fear, needing reassurances? Hugo revealing that she was a woman? The bond between the two, the talk? Hugo as a character, the story of her husband, the beatings, being with Cathleen, the love, his work, her dressmaking, her death? Getting out the dresses, the two in dresses, walking along the beach, very awkward, the run along the beach, Albert falling? Their going back, donning the men’s clothes again? Hugo and his not wanting to participate in buying the shop and running it? 8. The doctor, his relationship with Mary? Friendship with Albert, eating in the kitchen, coping with the typhoid, Albert’s death, his discovery of the truth? Going with Mary to England? 9. Helen, pert, her story, mischief in the hotel, attracted to Joe, walking out with Albert, Joe persuading her to get the chocolates, the whisky, Albert buying the hat? The humour of Albert calculating how long he could afford to walk out with Helen? Helen and Joe, the sexual encounter, her pregnancy, reactions? Hopes? Her talking with Albert, the proposal, showing Albert the nature of the kiss? The clash with Joe, his rejection of her, the fight? 10. Joe, his work, slipping on the ice, his fall, his being sacked, the arrogance of the rich man? The boiler situation, working hard, the success? Mrs Baker taking him on? His inability to write? The attraction to Helen, manipulating her, the chocolates etc? Her pregnancy, wanting to go to the US? The typhoid outbreak, trapping them in Dublin, his thinking that his life and her pregnancy was a cliché? The fight, his being responsible for Albert’s death? 11. The range of staff, Polly and the kitchen, the maids, the gentlemen servants, Sean and his black eye, wanting a drink? Patrick and his death? Traditional style? 12. The range of guests, some kind, some not? The elderly? The dining room, the meals, wanting a drink, breakfast? The nobility? Viscount Yarrell and his friends? The drink, the frankness, the keys? 13. The portrait of life at the hotel, Albert and his life, narrow focus? Yet the dream of the shop, taking Helen to the site, the explanations, his dream? Not fulfilled? The doctor commenting on the sadness of Albert’s life? 14. A portrait of human nature – differences and difficulties?